as evidenced by my post “My Pretty, Shiny New Baby.” Really, could I have picked a creepier title? No, I don’t have a knife throwing circus act, and I’m no Boy Scout, either. But my tale of stalking the knife counter at Sur la Table probably left you wanting to put a healthy distance between you and me and my knives. But seriously, your knives are your most important kitchen tools, and I’ve compiled a few tips for getting the most from yours. Tiny Tip #1: If you have good knives, do yourself a favor and take them right now to be sharpened professionally. It will not cost you very much at all. You probably only use two or three of them anyway, so start with those. Oh sure, you think they’re fine now, but you’ll be amazed when you get them back all razor-edged at how sharp they actually weren’t! Now sure, you can get a big knife set stuck into a honkin’ big block of wood, but if counter and drawer space is at a premium like it is here in My Tiny Kitchen, there is a better way. So, instead of buying eight+ crappy knives, invest in just two or three good quality knives that will last a lifetime and make your prep time fly by: a Chef’s knife, a paring knife, and a bread knife/slicer. Since the chef’s knife is the one you’ll use eighty percent of the time (not kidding here), it makes sense that you should invest in a good one that will make your chopping chores a breeze. That said, you can spend anywhere from $40 to $1,800 for a Chef’s knife at your local Sur la Table. With all that choice, what’s the difference? And is any knife really worth almost two grand?!? You don’t have to spend THAT much to get a perfectly respectable, professional quality knife. Cooks Illustrated regularly recommends the Victorinox Chef’s knife, available all over for just under $40. I know MANY chefs who use these in their kitchens. It may not be the fanciest knife in their collection, but it’s their ‘go-to’ knife for everyday use. You won’t be able to try it out in the store due to its packaging, but I can guarantee you will find this an incredibly useful, versatile knife of surprising quality. Of course, you can always purchase it from a retailer with a great, no-questions-asked return policy (like Sur La Table or Williams Sonoma, and no, I don’t get paid to say things like that) where you can always get your money back if it fails to perform up to your expectations. Tiny Tip #2: DO. NOT. PUT. KNIVES. IN. THE. DISHWASHER. Ever. Think of your dishwasher as a knife ‘UN-sharpener’. Knives will bang around mercilessly in there, ruining that straight edge. No steel or home sharpener is a match for the dreaded dishwasher. 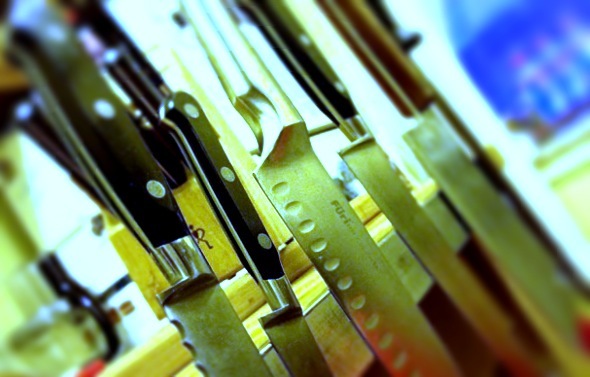 Wash your knives carefully by hand, and immediately dry them and put them in their proper storage spots. Make it a habit. It’s a small price to protect your investment. Your pretty, shiny knives will thank you with years of service. As for a paring knife, Kuhn Rikon makes a paring knife that comes with it’s own sheath in a range of cool colors for around $10. And it’s sharp. Like “cut your fingertip off” sharp. I know this for a fact. You’ll find them at those same stores. Victorinox makes a great bread slicer, too, in case you’re wondering. 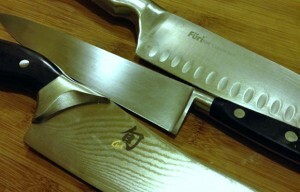 If you are still pining for a ‘set’ of knives, make sure you look for a ‘forged’ blade, as opposed to a ‘stamped’ blade. 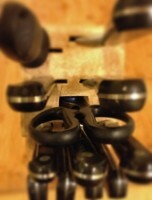 You’ll get better quality knives that will hold their edges longer and will be easier to sharpen. And avoid those micro-serrated “never needs sharpening” knives. They WILL dull over time. When they say “never needs sharpening,” what they mean is “there is really no way to sharpen it, so throw it out and get a new one.” A good knife is NOT designed to be disposable. Oh, and try to go to a store where you can hold the knife and maybe try it out. There is no “one size fits all,” and what’s comfortable for me might be really awkward for you. A good cutting board is a must. Materials to look for: butcher block style wood (generally the best), bamboo, regular wood, and polypropylene. For god’s sake, whatever you do, avoid at all costs glass or ceramic cutting boards. You might as well toss your knives down your garbage disposal! Since some cutting jobs are small (cutting a pear to snack on) and some are big (chopping ingredients for a big pot of stew), it’s nice to have a choice, so I like those sets of polypropylene boards with three sizes for under $25, which is about the starting price for just one good sized wooden or bamboo cutting board. Plus, the polypropylene boards can go right into the dishwasher or washed with a bleach solution to be properly sanitized, which is especially good when you’ve been cutting chicken. Wooden boards, not so much. They’re great for veggies, but for all around utility and value, go with a set of polypropylene. A sharp knife does more of the work for you, meaning less sawing and pushing, crushing your food into pieces, and more effortless slicing with perfect control. I get my knives professionally sharpened once a year, but maybe once or twice in between, I’ll run the blades through my home sharpener. I’ve had a couple, but the simplest, most effective (and ironically, the cheapest) I’ve owned is the AccuSharp. Don’t overdo it with your home sharpener, though. Remember, sharpening removes metal from your blade, so your don’t want to have to sharpen it more than necessary. 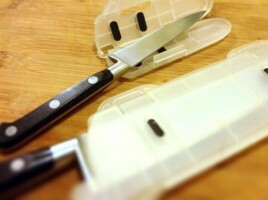 Improper storage is probably the best way to ruin a perfectly good knife. Tossing it in a drawer with no protection is not only a guaranteed way to ding and chip your knife edge, but it’s also good if you’re looking for a reason to visit the emergency room for stitches. Once you have a chip, only a professional knife sharpener can repair it, and they’ll need to remove a lot of metal in order to do it, severely shortening your knife’s useful lifetime. Knife safes - after my semi-amputation in OC, I got myself some decent knives and these! A knife block and drawer inserts with slots for your knives are great if you have a COUNTER or a DRAWER to spare from now until forever. A magnetic knife strip [like in the large picture above] can be a real spacesaver in a Tiny Kitchen, and they look great, or you can buy a knife safe (a plastic case that covers the blade) which will protect it in a crowded drawer. Finally, you’ll want a way to maintain your investment, keeping those edges sharp, sharp, sharp. A dull knife is more likely to cut YOU than a sharp knife is (as I proved in the gross story above). 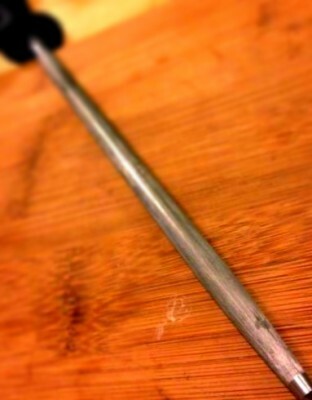 This is a steel. You MUST get one. And use it RELIGIOUSLY. Promise me you will. One MAJOR caveat: If you choose a Japanese or Eastern style knife (Shun, Global, Miyabi or any Japanese-sounding name–see My Pretty, Shiny New Baby), DO NOT sharpen them with the AccuSharp or any other home sharpener. They have a significantly sharper, thinner blade than most Western-style knives, so unless you invest in a professional Eastern sharpening system and learn how to use it correctly, you will ruin that miraculously thin blade. Take or send these knives to a professional. Chances are, if you’ve invested in one of these premium knives, protect that investment. They are AMAZING kitchen tools, but maintaining them is best left to professionals. I use my AccuSharp on my western style Henkels and Furi knives, but my beloved Shun will get sent to a professional shop once a year for a grand total of $8 a pop. Money well spent. OK. Clearly I have a thing for knives. While I have amassed a wonderful collection of cooking paraphernalia over the years, decent knives were the first thing I invested in. They are the one tool that I use to make EVERY meal. Even though I love to cook, I’ll admit that some nights, my knives make the difference between take-out and homemade soup. I reach for the handle, feel the balance as I pinch the bolster, and enter that Zen place where a perfect half inch dice is effortless and all is right with the world. And I chop. I think this post is hilarious because I used to work the knife counter at Sur La Table, and I live in an Oakwood temporary apartment right now in Philly. I agree with you about most points, most definitely how terrible the knife block in this apartment is!